This is the standard tin foil dinner I make for my son Mark each and every month when he heads off to camp with his scout troop. fried chicken and potatoes that are smothered in BBQ sauce. I make it every time. Little Caesars Pizza for his tin foil dinner. 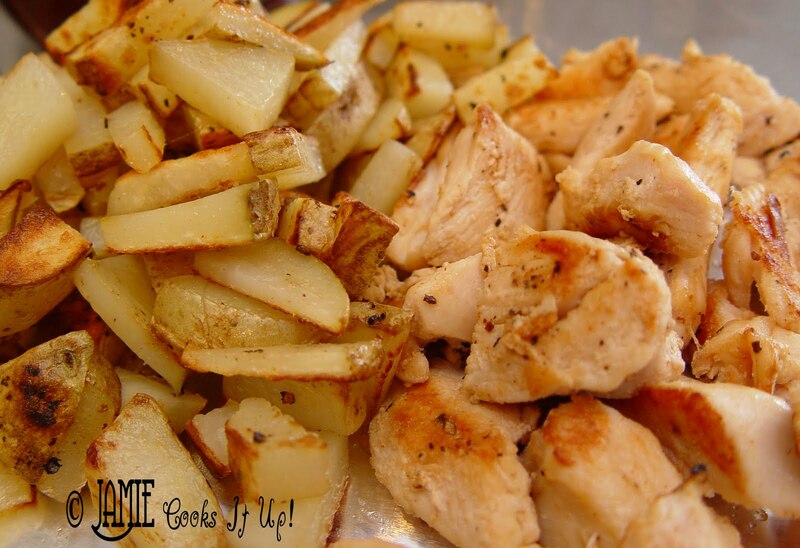 If you wanted to make this for your family for dinner…you could! Just double or triple the recipe, throw it in a 9X13 pan, cover with foil and bake for about 20 minutes. You will be good to go! 1. In a large skillet melt 1 T of the butter over medium heat. Add your chicken pieces and sprinkle with seasoned salt and cracked pepper. Cook until golden brown on the out side. 2. Set chicken aside and melt the other T of butter in the skillet. 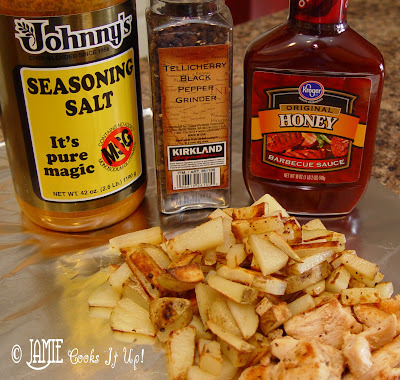 Add the potatoes to the skillet, sprinkle a bit more seasoned salt and pepper and cook until golden brown. 3. On a large piece of tin foil place the chicken and potatoes. 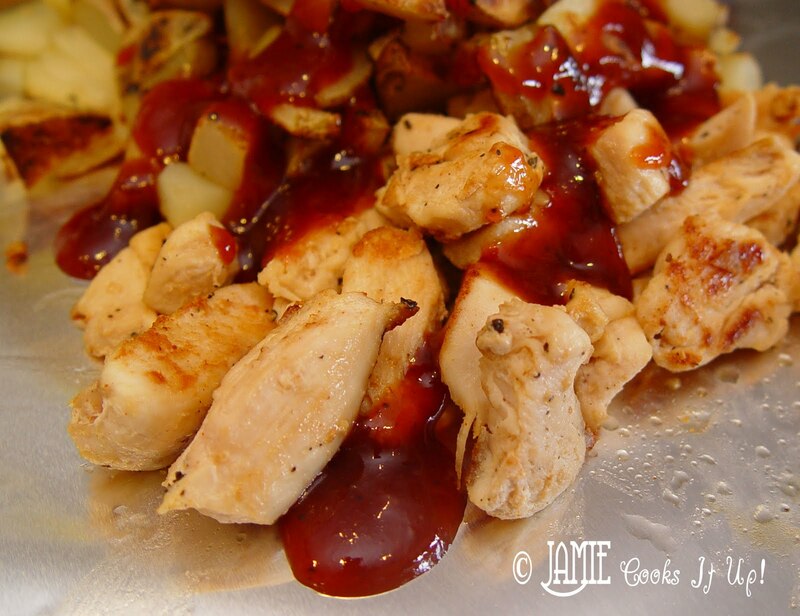 Pour the BBQ sauce over the top of the chicken and potatoes. Wrap the tin foil up and over the dinner. Wrap it in another sheet or two of foil. 4. Throw it in the fridge until it’s time to go, then send it in a cooler with your dear boy. Mark tells me that he places the tin foil dinner on the hot coals of the fire. Not directly in the flames. It should heat through in about 15-20 minutes. Send your boy to scout camp with a hug and a kiss as well. Don’t let too many folks see you kiss him….this will ensure that he’ll want to keep giving you those kisses. I sure hope they don’t ever run out…. Question – what are the instructions to finish these foil meals? Do they need to continue cooking or are they cooked and just need to be reheated? Great idea Jamie – I'm a fan of 'precooked' tin foil dinners! Enjoy that boy while he still IS a boy! Wow that looks great and super easy!! Thanks for sharing! Mark tells me that he places the tin foil dinner on the hot coals of the fire. Not directly in the flames. It should heat through in about 15-20 minutes. This looks great! I have five sons (all of them are Eagle Scouts) and I have made TONS of foil dinners over the years. I never…ever…thought outside of the box and made anything but the hamburger, sliced potatoes, carrots, onions foil dinner. (You know the one I mean!) My boys would have loved taking this…or pizza…for a change of pace. They will all be going camping with their Dad in a few weeks. I'm going to surprise them big time(I think Hubby will be pleased, too)!! THANK YOU!! I love it!!!!! 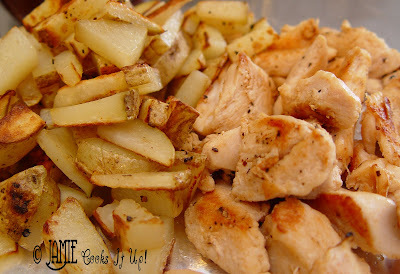 I have been looking for a foil dinner recipe that uses chicken! They make great easy meals out on the grill,too! I made it for dinner tonight! It was super easy to make, it was yummy and the kids DID eat it. I'm so happy I saw you on the news. I love your blog. I want to make so many of your recipes. Keep them coming! This is dinner tonight! 🙂 Yummo! So glad they liked it! Thanks for letting me know! We tried this out on our recent family camping trip. I loved being able to prepare it before hand. It was so easy! I found the recipe by googling kid-friendly camping meals…Thanks for posting! This is a great recipe. But I feel its important to note, Scouts should be making their own meals! Scouting is about developing skills. A boy needs to learn how to do it on his own. Mom’s should not be making their meals for them. As an assistant scoutmaster I frequently see scouts struggling with advancement, or they aren’t learning basic skills. Please let them do it, all of it, on their own. David, you are so right. Yes that is what scouting is all about, teaching them skills that will form the foundation for what they do in life. You have to be prepared for the young man to fail. Actually, even pre-cooking is wrong. I didn’t learn that a potato or a carrot can take a while to cook, except by being to anxious and opening my package too soon, or that food will burn if left too long. Nothing but experience could teach me that. Not to worry we never went hungry, we ate our mistakes and tried to teach others along the way. Hobo Tin Foil Dinners – easy camping meal foil pack recipes and food ideas that are time-tested and don t require a lot of time and cooking gear.